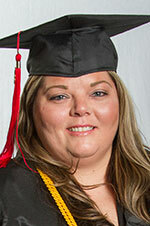 REDDING, Calif. - Red Bluff residents Amber Wilson, 33, and Elizabeth Senzell, 38, decided to return to college to earn their bachelor’s degree because they felt a pull to do more with their lives. In addition to pursuing her dreams, Senzell said she also wanted to set a positive example for her four children. On April 30, Wilson and Senzell graduated from Simpson University’s School of Adult Studies (ASPIRE degree-completion program), both with a B.A. in psychology. They also were both inducted into Alpha Sigma Lambda, a national honor society for continuing education students who maintain at least a 3.8 grade-point average. While in the ASPIRE program, Wilson and Senzell were part of the same 16-month-long online degree program. They stayed connected with professors and classmates using Skype and Moodle, Simpson’s online learning management system. In addition to psychology, the ASPIRE program offers an online B.A. in organizational leadership. 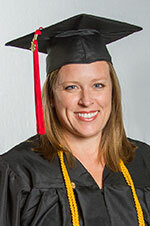 Senzell liked the online degree option because of the flexibility the program offers. Another reason the online program appealed to Wilson was the opportunity for her to spend more time with her son, Logan, 13. “As a single mother working full time, the program has really allowed me to work at my own pace and schedule while I work and take care of my son,” she said. In fact, Wilson said her son was one of her biggest supporters during her time in the ASPIRE program. Senzell’s family has also been supportive while she was working toward her degree, even when balancing home and school responsibilities became difficult. Senzell said the most rewarding parts of the program were the professors and her classmates. Based on their positive experiences, Wilson and Senzell said they would recommend the ASPIRE program to others. Based on her recommendation, Senzell’s husband, Justin, is working toward earning his B.A. in organizational leadership. Although they both earned a psychology degree, Wilson and Senzell are taking different career paths. In August, Wilson plans to earn her master’s in counseling psychology through Simpson’s School of Graduate and Professional Studies. Senzell will be pursing her master’s in education and teaching credential through Simpson’s School of Education in order to become an elementary school teacher and eventually a school administrator.